We generally clip our sheep by hand using the same pattern of shears that has been used for at least 100 years. The Boreray sheep can be plucked (rooed) if the fleece is lifting. 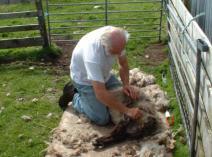 Plucking makes a neater job than shearing but you don't get the fleece off in one piece. Some of the bigger flock owners employ contract shearers who travel around the townships. The St Kildans used the island of Boreray as additional grazing for their flock, and these sheep were not evacuated in 1930, and their descendants, now called the Boreray breed, are still there. Since it was not easy to get to Boreray, and it was even harder to transfer sheep, the flock on Boreray reflected the changes in the Hirta flock only slowly, and after 1930 they had to survive entirely without man, as they do now and will do in the future. The sheep on Boreray are therefore of great interest. They are feral and by virtue of their isolation may justly be called a breed. The problem was that until 1971 little was known about them, and it was only in that year that they reached the mainland.